I spent today poking around with SAMI, Samsung's data exchange platform. The power of SAMI is awesome. It's platform agnostic. That means that it will take data from any type of device - FitBit, smart lightbulb, connected washing machine - and make sense of it. How does it make sense of data that could range from strings to integers to hexadecimal to binary, or even be a combination of all of the above? It uses something called the manifest. We'll get into that in a bit when I show you how to write your own manifest. And I promise you that this is truly a beginner tutorial. If you've ever used a Seeedstudio Grove Kit, this first bit will be familiar to you. 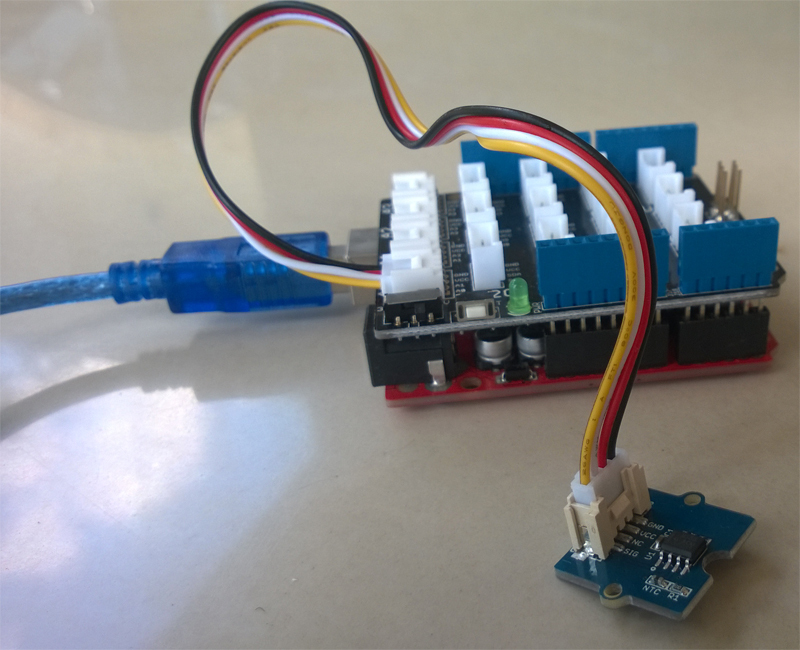 Simply plug the Grove shield into your Arduino (or any other device that's compatible with the Grove Shield - Intel Edison, Linkit ONE, etc) and connect the temperature sensor to A0. There's a great sketch on the temperature sensor page that will work well for our needs with a few changes. Upload it to your Arduino and check the serial monitor. You should see the temperature being output in Celsius once every second. We don't want that much data, so we're going to modify the sketch to only transmit every half minute. Normally you'd probably only want to take the temperature every five minutes or so. Also, if the data isn't a number we should turn it into a number so that our code doesn't crash. If we ever see the temperature spike to 1000 we'll know that there was an error. Sign into the SAMI User Portal. If you don't have a User Account you can register for one now. SAMI has two portals, the User Portal and the Developer Portal. They look very similar, so don't get confused. On the User Portal you can connect, manage and view your devices and their data. On the Developer portal you can add applications and device types (those manifest things we were talking about earlier). Open the Developer Portal in a new tab. We're going to create a manifest for talking to an Arduino with a temperature sensor. Select "+ New Device Type." We'll name it "Temperature Sensor" and give it the unique name "io.hackster.temperaturesensor". Then click "Create Device Type." This takes us to the Simple Manifest wizard. In this tutorial we'll keep it simple - Advanced Manifests come later. You can still rename the field once the type has been selected. I'll go ahead and rename "temp" to "temperature." Now go ahead and click "Next: Actions." Actions are commands to do things like turning a light on, setting a temperature on a thermostat, or locking a door. We don't actually want to add any actions in this tutorial because we only want to take information. All you need to do on this screen is click "Save New Manifest." That's it! Simplest Manifest ever! Now go back to your User Portal. Name your device (e.g., “Monica Temperature Sensor”). Click the name of the device you just added. In the pop-up, click “Generate Device Token…”. A Device Token will be generated. Make sure you have Node installed on your computer and the node package manager (npm) installed on your computer. Great. Now all you need to do is edit the code with your Device ID and Access Token and we'll be up and running! Now we're going to want to swap out the lines of code that say "INSERT_DEVICE_TOKEN" for the Device Token you saved in Step 3. We're going to swap out "INSERT_DEVICE_ID" for you-guessed-it! the Device ID we saved in Step 3. You also need to replace "/dev/ttyACM0" in line 7 for your Arduino's com port. It might be something like "/dev/tty.usbmodem621." Go back to the Developer Portal and take a look at your manifest by clicking on its. There's only one value that we're collecting, temperature. With that in mind, we know that each time we transmit data from the device we'll need the device ID, the message type, and the data. You're ready to launch the Node server and start transmitting data! This will start the data transmitting from the Arduino to SAMI. The gibberish you see is actually the Message ID (mid). Open up your SAMI User Portal. Remember that this is where we can see the data being transmitted? You can see the data coming in, slowly but surely. Use the magnifying glass or click on the times to change the time increment shown. You can also check out the data logs. If you click on the icon on the left, right below "Export Data," you can choose the field types that you want to see. Want to take this to a more permanent setup? You could run the server from a Raspberry Pi, like they did in this tutorial on Samsung's Blog that this is based on. *  Serial monitor to get the result.